Some of the offerings from Bistrozine. In Europe, particularly, in France, bistros are well known for moderately priced, exceptionally good food in a relaxed setting. The menu is small, but the offerings are well prepared and satisfying for lunch or dinner. Bistrozine, at 409 East Calder Way, is open Monday through Thursday from 11:30 a.m. to 10 p.m., Friday and Saturday from 11:30 a.m. to 11 p.m., and Sunday from noon to 9 p.m. Bistrozine’s simple and clean décor features an open kitchen, comfortable booth seating, and trendy swing chairs for a fun dining experience. Each of the menu selections is highlighted by a beautiful glossy photo taken by Liu, so customers know exactly what to expect. On the menu, there are slow-cooked pork ribs served with honey-chipotle aioli, overnight soy-marinated chicken wings coated with a sweet ginger-chili sauce, and bowls of specialty ramen with shiitake mushrooms, soy-marinated hardboiled eggs, and beef meatballs. The popular Ocean Explosion is wonton-wrapped seafood bites on a guacamole base, drizzled with a sweet and spicy aioli. “This is food that I spent a lot of time cooking for my family,” Liu says. 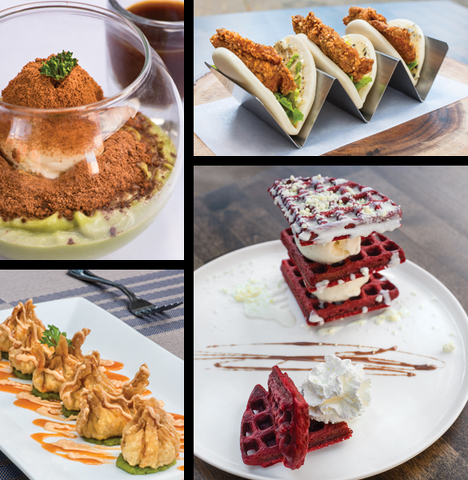 Bistrozine, open since August, has a number of specialty beverages and teas to pair with meals, including the Mango Monster, Everything Matcha, and Crème Brulatte. There is also a selection of Chinese teas that boast many health benefits. SPECIAL OFFER: Mention the Bistrozine Taste of the Month article in Town&Gown and get 5 percent off your order. Expires: 11/30/2018. Leaving a career in sales at a luxury car dealership in New York City was a difficult decision, but Liu wanted to pursue his dream and escape the hustle and bustle of the city for a quiet, more laid-back environment to raise his young family. He moved his family to State College in January after visiting his niece, who is a Penn State student, and falling in love with the area. “My wife and I have a 2-year-old daughter and a 4-month-old baby boy,” Liu says. Originally from Indonesia, Liu studied in Germany for five years before moving to New York City. While living in Germany, he traveled across Europe, sampling different foods. Liu also spent some time working as a manager at an upscale Japanese restaurant in New York City. At Bistrozine, Liu draws on his international food experience to introduce diners to new flavor combinations. Other desserts to try include the Chocolate Matcha Lava Cake, Green Tira Miss U, and the Earthquake – the only item on the menu without a photo; you have to order it to see it. In addition to the regular menu, Bistrozine will also be featuring a special sweet or savory brunch menu on Saturdays and Sundays from 11:30 a.m. to 4 p.m.
Are you in the mood for classic French toast drizzled with honey, topped with whipped cream, fresh berries, and a side of taro coconut cream? How about red velvet waffles with vanilla ice cream topped with Toblerone crumbs and white chocolate cream sauce? On the savory side, diners can sample a RAM-Lette: ramen, bacon, mushroom, and bell peppers served with mozzarella cheese and a sweet and spicy sauce. Other savory brunch offerings include chicken and waffles, house scallion pancake, shrimp and chips, and a Piggy Benedict that features slow-cooked, deboned barbecue baby back ribs served with two sunny side up eggs, chipotle aioli, and house-cut potato fries. For more information, visit bistrozine.com, or call (814) 826-2492. For a special offer, visit townandgown.com.